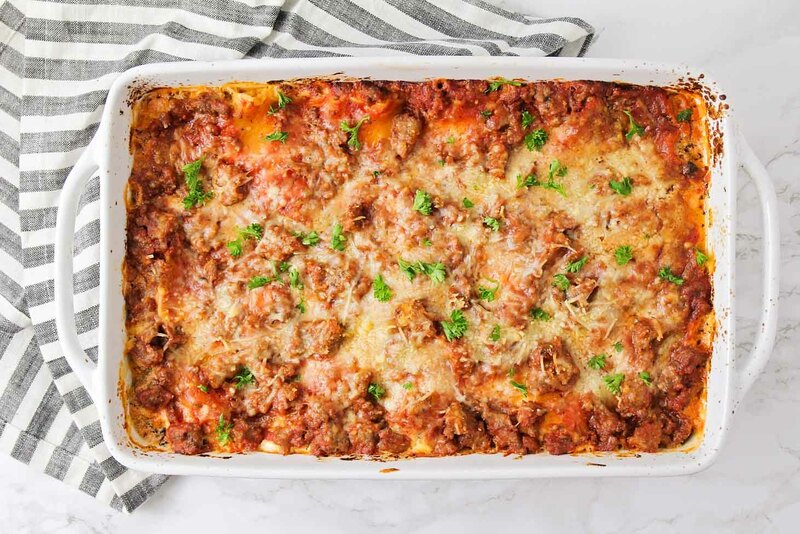 Our family’s favorite lasagna recipe – not only because it’s delicious but because it’s so EASY! You don’t even have to precook the lasagna noodles! With beef, pork, three cheeses, and tons of seasonings, you know this recipe is going to be a hit! I’m sharing our family’s favorite easy lasagna recipe today! My mom makes Lasagna for the family all the time (we love all lasagnas and also make Chicken Lasagna and even Lasagna Soup). It’s one of those meals that the entire family loves, and one that feed a crowd. Over the years my mom has tried a TON of Lasagna recipes, but recently she has been using the same one because all of us kids loved it so much. The recipe comes from the awesome ladies at Favorite Family Recipes. My mom modified it a bit to our family’s liking and we will probably continue to make it again and again because it’s so easy and so good. One of the reasons this recipe is so simple is because it calls for no boil lasagna noodles! 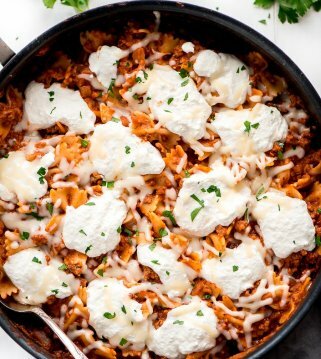 So you just have to cook up the meats and seasonings with the tomato sauce, combine the three cheeses, and then layer everything with the uncooked noodles in your 9×13 pan! The noodles cook while you’re baking the lasagna in the oven. It’s so much faster! This homemade lasagna recipes is simple but has several layers to it. Here they are to help in making this delicious dinner idea. Layer 1 – 1 cup of sauce – this helps prevent the lasagna from getting dry, and the noodles from sticking to the pan. Once everything is layered, you will bake for 25-30 minutes. We recommend letting the dish rest for at least 15 minutes to let the layers firm up a bit before cutting into it. Do you cook lasagna covered or uncovered? If you leave your lasagna uncovered in the oven, it will become dry. Fight back with a foil-topped tray for a portion of the baking time. Once the lasagna has baked at least halfway through, remove the foil so the top can brown. If, once it’s fully cooked, the top still looks pale, turn on the broiler to help move things along. But keep an eye on the casserole; it can burn quickly. Why is my lasagna soupy? A few things can cause too much moisture in lasagna. 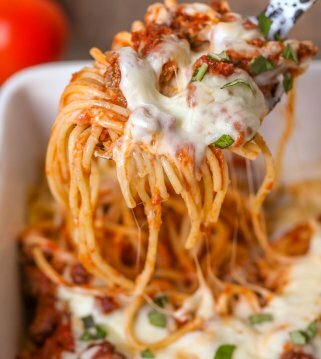 If you use a really thin tomato sauce, or non-fat sour cream and cottage cheese, there will be more water content in your ingredients, causing the lasagna to be soupy. Also, if you live at a higher altitude, it may require a longer baking time than listed in the recipe. 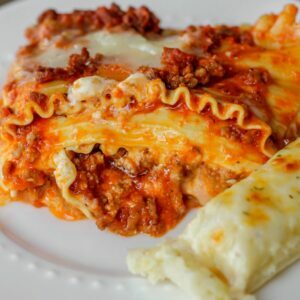 While you can make lasagna ahead and refrigerate or freeze it, it won’t necessarily reduce the moisture content, but the no boil noodles will soak up the watery sauce. What are “no boil” lasagna noodles? Similar to “instant rice,” no-boil noodles are precooked at the factory. During baking, the moisture from the sauce softens, or rehydrates, the noodles, so there’s no need to boil them before assembling your lasagna. 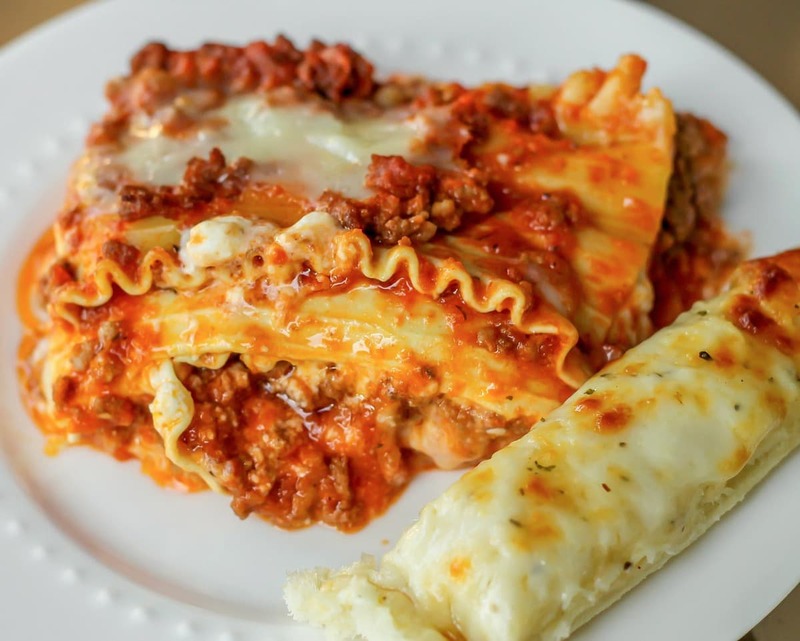 You can reheat small portions of lasagna in a microwave by placing it in a microwave-safe container and adding a bit of marinara sauce or water on top. This prevents it from drying out in the microwave. Cover it with a lid or a microwave-safe plate and heat for 1-2 minutes, or until the lasagna is heated through. If you’re trying to reheat larger portions (however much is left in the pan), pour about ¼ cup of water or marinara sauce over the lasagna and cover it with aluminum foil. Bake for 25 minutes at 425 degrees F, or until the lasagna is hot and bubbly. Can I use ricotta instead of cottage cheese? Yes, just sub out equal amounts of ricotta for cottage cheese. The only difference between the two is a matter of texture and nutritional value. Cottage cheese is lumpier, while ricotta cheese is grainier, although cottage cheese has fewer calories and grams of fat. Seriously – you can never go wrong with lasagna for dinner. It’s just too good, and I will never turn it down with all it’s cheesy meaty goodness! what to serve with lasagna? 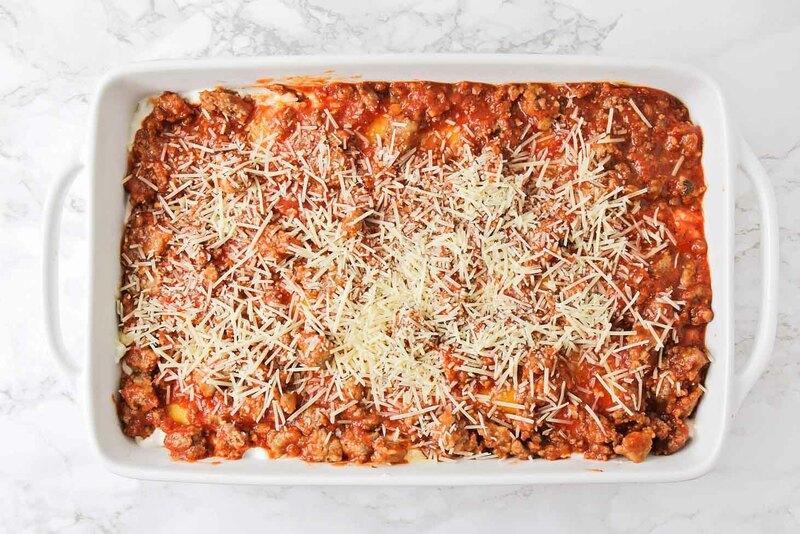 Our family's favorite lasagna recipe - not only because it's delicious but because it's so EASY! You don't even have to precook the lasagna noodles! With beef, pork, three cheeses, and tons of seasonings, you know this recipe is going to be a hit! In a pan, saute garlic in Vegetable oil on medium heat for 2-3 minutes. Stir in basil, salt, a little pepper, and tomato sauce. Simmer for 10 minutes. Turn down to low and continue to simmer. In another pan, brown your beef and pork. Add browned meat to your sauce and continue to simmer. In a bowl, combine Parmesan cheese, cottage cheese and sour cream. Mix well. Set aside. In a 9x13 pan, spread 1 cup of your sauce on the bottom. Layer with lasagna noodles and spread another cup of sauce on top of the noodles. Add a layer of sliced mozzarella cheese and then half the sour cream mixture. Then add another layer of noodles, followed by a cup of sauce, another layer of sliced mozzarella and the rest of the sour cream mixture. Then add one more layer of noodles and the last of the sauce. Add Parmesan cheese to the top, cover with foil and bake for 25-30 minutes (taking foil off for the last 5 minutes of cooking). LOVE lasagna! And I didn’t know there was a national day for my love 🙂 This looks great! So glad you posted this! Most lasagna recipes seem to have ricotta, and I much prefer cottage cheese in mine. Yum!! The recipe didn’t say, but is it correct to assume that the cottage cheese gets mixed in with the parmesan and sour cream? Sounds yummy!! Can’t wait to make it. I usually make something like this in two pans and give one to the Elder and Sister missionaries in our ward — they always love these dishes. So is it right then that you don’t cook the lasagna noodles?? Just want to be sure. So I am assuming you don’t cook the lasagna before you put it in the dish since it said no boil? I tried this for supper and it was soupy and not done by the time it said it was supposed to be!! Never making thisagain! So sorry to hear that, Erin. We’ve made these countless times and have never had issues. Did you follow the recipe exactly? Hello, I sometimes have soupy lasagne as well. One tip that has been very beneficial to me is to “dry out” the cottage cheese first. Place the cottage cheese between layers of paper towels and go over it with a rolling pin. Do this twice with fresh paper towels the second time. I hope this helps. I have found it depends on the sour cream and cottage cheese you use, the higher fat contEnt, the less soupy it will be. I Usually buy low fat sour cream and cottage cheese but when making dishes like this I go for the higher fat aS they arent as watery. Cant wait to try this tonight! Sounds awesome! I purchased the ingredients but want to make sure you do not boil the noodles? I’m making this tonight! Just finished making this and it’s so soupy and watery, I don’t know what I did wrong I followed the directions exactly. The only thing I can think of trying would be to add about half the sauce and cream cheese mixture and maybe that would help. I don’t think I’ll attempt to make this particular recipe again. So sorry you had issues, Angie. We’ve never run into problems before. I know ovens all work differently, but hopefully you didn’t have to cook it much longer. I just put mine in the oven, I added a 12 oz can of tomato paste. Mainly because I like the taste of the tomato paste, but also because the recipe my mom used called for it. It helps thicken it up. I’ll let you know how it turns out. It is a very dense and deep recipe, I am not surprised it takes longer. But I think any lasagna I’ve ever made took longer than the recipe stated. I have always did half tomato sauce and half tomato purée and a small can of roasted tomato paste. This should take care of the soupy consistency. Also I used full fat sour cream and full fat cottage cheese. This looks delicious!!! As does the garlic bread! What is your recipe for the garlic bread? I always make my lasagne the day before and never had a problem. In fact I choose to make it when I need to do something in advance. My daughter wants my recipe but I do not have one. I wing it using a store bought sauce. This recipe intrigued me with no cook noodles and sour cream. I must try. Thank you for sharing that!! Let me know what you think of this recipe!! If I wanted to make and freeze would you recommend cooking and then freezing? If so how long do you think it would take to heat through? When I make lasagne I sometimes do a double batch and freeze one uncooked. I think if you cooked it first the cheese would not taste right, based on what my cooked cheesy soup does when frozen. How many servings does this recipe make? Also, I’m not a cottage cheese fan…can I sub ricotta instead? Thanks!! Do you use plain ground beef and pork, or do you use snazzy italian/seasoned ground pork products? I ended up trying hot pork Italian sausage instead of the plain ground pork in my first attempt at making this lasagna. I also assembled the lasagna the night before I baked it, and kept it in the fridge over night. I let the lasagna sit at room temp about an hour before I baked it and then upped the cooking time by 15 minutes, including a few minutes under broil, to brown the cheese a bit. It was my opinion, and that of my whole family, that this was the best lasagna we’ve ever had. Thanks so much for such a great recipe! Oh yeah, I also wanted to mention that my lasagna was a tad soupy, and I believe that it would have been worse had I not put it in the fridge overnight (where everyrhing had a chance to draw up some of the juices. I live at 6000 ft altitude, and believe that the problem is that I probably just needed a longer baking time than you would in lower altitudes. Either that, or I suspect that using 1 cup less tomato sauce would be fine, too. I found this on pinterest because the picture intrigued me! Every other lasagna i’ve made was too dry, or the noodles took too long..etc. This was quick, easy, and delicious! Though I used butter to sautee the garlic and added diced onions. Not soupy here! Try using butter instead of Veg oil- only thing I can think of that would make it soupy. Thanks for the recipe! Making this for my Sunday supper it’s canadian football division finals. So I’m hoping it’s great an I have tried other recipes on here n they haven’t failed me. I have made this recipe for company and potlucks and it is an absolute favourite. People love it! I have made it a day or two ahead and kept it refrigerated or freeze it and pull out when needed with no need to bake first. It works to thaw it out and then bake but you can also bake from a frozen state. The bake time does increase when you bake from frozen. 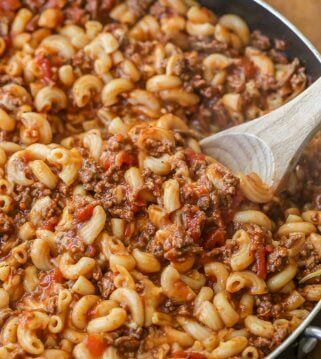 I use only ground beef and depending if I have parmesan cheese on hand, I may or may not use it. Sometimes i’ll add a bit of grated parmesan cheese instead. Most of the time I will divide the recipe into two pans depending on how many people I plan to serve at one time, which can give you two separate meals then. Thanks for the recipe! Super easy and delicious! The grocery store had packaging in the exact amounts that the recipie called for, which was convenient. I had a little extra cheese mix and sauce left over, probably because the noodles I used didn’t quite fill the pan, so I added an extra layer, and used ricotta instead of cottage cheese. Had to cook a tad longer, probably because the extra layer, but wasn’t an issue for us! Glad I chose this recipe. Are you able to prepare this ahead of time and refrigerate you think? 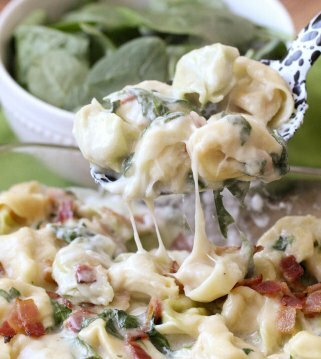 I’ve made this several times and it’s always a big hit! Making it for my son’s birthday dinner with family tonight and was thinking about preparing it ahead of time to make life easier on myself 😉 Thanks in advance! Of course! I’m all about prepping ahead of time! Just cover it well and you’re set! Thanks so much for sharing!! HI there, I did not buy NO Boil noodles So Should I just cook them first? Or add extra water for the regular noodles to cook during oven time? Hi this recipe sound delicious. i was just wandering why you use cottage cheese instead of ricotta? whats the differance between them? I’m sure you could use either. I’m posting a link that talks about the difference…https://www.reference.com/food/differences-between-ricotta-cheese-cottage-cheese-cb0c507177b79351. Hope that helps!! Will this recipe work with reg lasagna as long as they are boiled first? It should 🙂 Thanks so much for stopping by!! This REALLY is THE BEST lasagna. I had never thought of putting sour cream on it but boy does it do the trick! I didn’t have cottage cheese so I used queso fresco I had left, and it still turned out amazing. I also used ground turkey instead of beef and pork and still turned out o be the best lasagna. Lets just say we licked the 9×13 pan clean! Thanks so much!! Those sound like great changes..thank you for sharing!! Many people are saying it’s soupy or watery. I wonder if it depends on the percentage of the cottage cheese and sour cream. The light and no fat tend to be more watery in general. I plan on making this soon!! It looks great! Good point. I wish I knew for sure why some are soupy. I mean there is a little liquid when cutting into it, but it shouldn’t be too watery. I made it the other night and it turned out great!! I typically by low fat sour cream and 1% cottage cheese but I did get the regular sour cream and 2% cottage cheese for this and it wasn’t soupy at all!! It was delicious! I have never thought to add sour cream before! 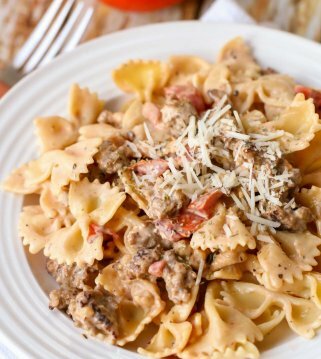 I am making this tonight, I noticed the tomato and meat mixture was a little lose so I just added 2TBS water and 1TBS cornstarch to a cup and mixed it. Added about half that mix to the pot and it thickened right up! Definitely excited to see how it turns out!! Also will be trying those fried zucchini tonight!! Those go great together!!! Let me know what you think. I hope you like it 🙂 Thanks so much! Kristyn, this recipe is out of this world! I can’t believe how great your lasagna is! This must be the best lasagna on the web! LOVED IT! Do you cover with tin foil when you bake it? Nope 🙂 Hope you like it! Oh my! I have died and gone to heaven! I love this recipe and I am now a fan of cottage cheese in lasagna and I will never go back to ricotta! The first time I made this, I was shocked and so happy w/ the flavor and outcome of this lasagna. No messy, sliding all over the plate mess. Just a perfect plate of deliciousness. When I had to travel up North for family business, I froze three helpings for my husband. He ate them all!! Usually he goes out to eat when I am gone, but this was so good the first time, he knew it would be even better the next! I am making this again for friends tonight for our recurring card night. Thanks so much for this great recipe. Love hearing that! I’m so glad your hubby liked it, too 🙂 We make it quite a bit! Thanks so much! It’s yummy.. but takes wayyyyyyyyyy longer to bake. I mean like 3 times as long. My kids were starving!! Delicious!! Was nervous after reading some people found it soupy and that it took longer to bake, but I followed the directions exactly and it wasn’t soupy at all and was ready in the 25 min of baking time. I will definitely make again! Woohoo! Glad you liked it! It’s one of our go-to’s! Thank you! I made this lasagna for our Christmas dinner and it was out of this world delicious! Will not lose this recipe! Thanks. You are so welcome 🙂 This is the best lasagna! Glad you liked it! Forgot to give it 5 stars!!! I am going to try this Sunday for dinner with a salad. Thank you for sharing I have made a few of your things and they have all turned out GREAT!!!! I’m so glad 🙂 I hope you all like it!! I have extra mozzarella cheese slices can in add that on top at the end before I bake it? I made it the every step said and it was still watery not sure why????. Oh, no…I’m not sure why either?? You didn’t change any amount? Thanks so much for giving it a try! I made this lasagna for Easter. It was DELICIOUS!! I’m not even that good of a cook and I seriously think it’s probably the best lasagna I’ve ever eaten (including restaurant lasagna). I will absolutely be making this again as well as sharing this recipe with friends and family ???? Tried to give it 5 stars but it would only let me give it 4. 6 cups of tomatoe sauce? Is that correct? Yes 🙂 I hope you like it!! Great recipe!!! Not surprised because I love all of your recipes!! Thus I was looking for recipe for how to make Lasagna Recipe. By Googling it I found your site, thanks to you for sharing such useful information. In images this dish is looking very delicious and finger liking good. I will try this because its delicious and looks easy to cook. I am so glad you found it!! This lasagna is delicious!! I hope you like it! After reading your blog over here. Tried this Lasanga recipe at my home twice and both time it was delicious. Thanks you so much. I’m confused as to why you make SO much sauce (6 c tomato sauce plus two pounds of meat) to only use 4 cups in the actual lasagna. Did I miss a layer or do you put like 3-4 cups on top when it says “the rest”? My pan is filled to the brim and I have tons of sauce leftover. Hmm. In the oven now…. It does reduce a little, so it’s the perfect amount 🙂 I hope you like it, as much as we do! Creamy lasagna! It was great recipe. Thanks for perfect simple recipe, just what I was looking for … tasty! You are so welcome 🙂 Thank you for stopping by! Hope you like it! Hi Kristyn thanks for providing useful information about Lasanga recipe. I really enjoyed reading your blog. This really is a great recipe and the way my Abuela from Zihuatanejo causes it to be I’m excited to check some of the recipes Kristin! I really like your replies everyone has gaps within their kitchen and that you aren’t scared to step outside the package. Keep up this! For the”women” who bashed; pity you! What happened to others! My family loves this recipe!! It has become a Sunday staple! It is super easy to make & has so much flavor. I love that you have so many delicious sides that go great with this! This Lasagna recipe is great and easy to make. I love my traditional lasagna recipe that I make and don’t vary from it very often. BUT I had to try this recipe using both beef and pork sausage. The flavors were so good. Best of all my kids love it as much as my normal recipe. Lasagna is one of our favorite meals. We try making it Once a month and with the ease of this recipe its very doable. Its something everybody loves! I really want to try this recipe but am hesitant about I can’t stand sour cream. Can you taste the sour cream or is it just THEre to add creaminess? It definitely adds creaminess. I might be just so used to the flavor, but it doesn’t stand out. You could substitute yogurt. Hope that helps! If I am going to make and FREEZe THIs,what do you think the Reheat time should be? I would let it thaw out & heat as the recipe suggests. Can i use the regular lasagna Noodles? 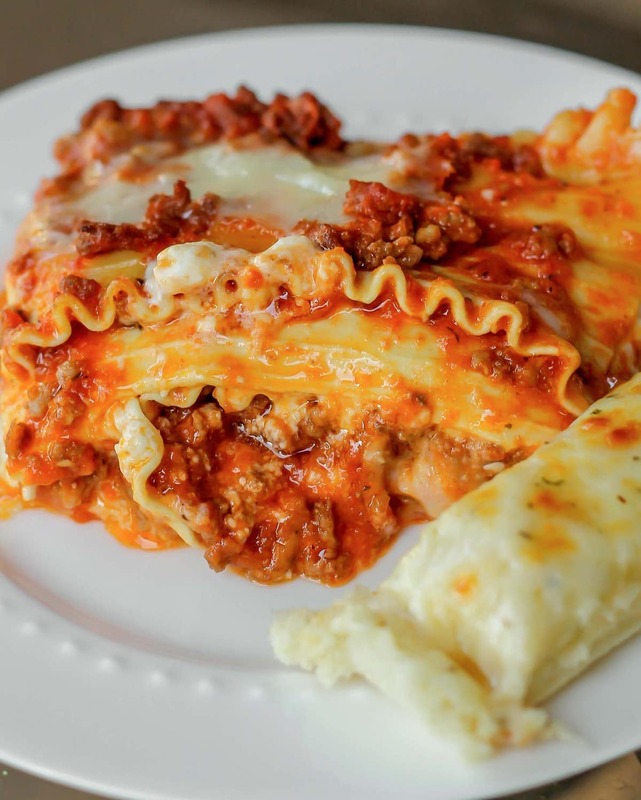 Do you have to boil the regular lasagna noodles first or will they also cook in the dish? The no boil lasagna noodles are precooked, but the regular ones aren’t. I would boil them first, then add them. 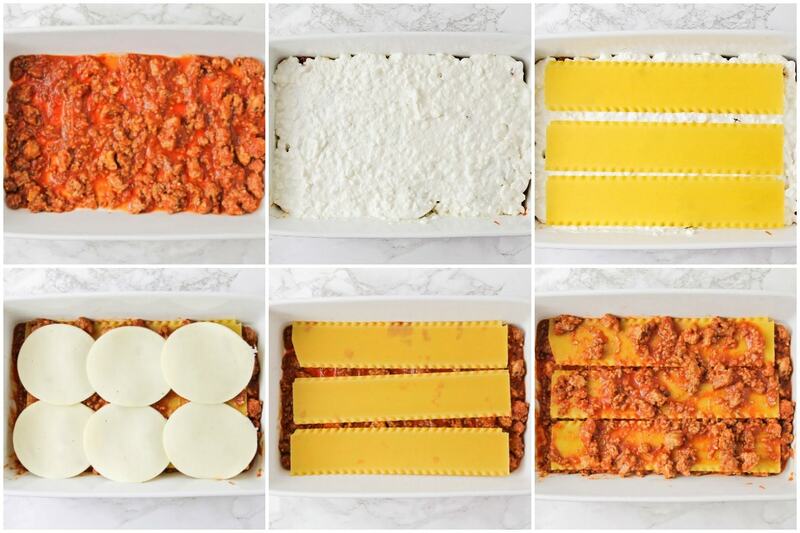 this truly is the world’s best lasagna recipe! so tasty! omg, yum! BoYfriend said it was the besT lasagna he’s ever had! To cut down on The carbs, i substituted one laYor of pasta for One layer of thInly sliced Zucchini and iT Was heavenly! The lasagna actually took 45 Min In the Oven, not 25-30. You know it’S done wiTh the cheese on top is lightly brown, and ThE sides are buBbling. I am so glad he liked it!! Great substitution! Thanks for sharing! You are so welcome! I am happy that you liked it. Thank you so much! Have you ever tried cutting this recipe in half? i’d love to try it but seems like a lot for me, my husband, and two toddlers. I followed the directions as said except I didn’t have sour cream and I used Philadelphia Cream Cheese in place of IT. That works 🙂 Thank you for sharing that! Sure hope you like it!! Okay, so my mom holds the best lasagna ever title but this is #2! my new go-to lasagna recipe! everyone loved it! LOl..I’ll take that 🙂 Thank you! 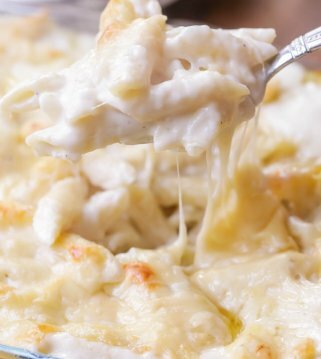 in the sour cream mixture do you use grated parmesan or shredded? You really could use either, since it melts a little, but I used shredded. I added an egg to the cottage cheese, and souR cream mixture So its not soupy, and it turned out grEat! This recipe is delicious!! Perfect!! Glad you liked it!! Thank you so much! This reciepe is so good and easy to folloW. Only difference i did was adding Sliced provalone with the sliced mozz. and used butter insteAd of veg oil. I ran into the soupy affect but 1.) i could tell it was going to happen before i put it in the oVen, i think i added to much sauce to the bottom & it swalloed the nooDles. 2) i upped the cooking time and broiled on high for a few minutes. The first fEw pIeCes were soupy but the rest was Fine! 🙂 highly recComend! Thank you for sharing that! I love the added cheese & butter! Tastes Great! The noodles were still tough in the middle after the listed cook time, but it turned out okay in the end. Do tou add extra water for the no bake noodles ? Nope, just follow the recipe as stated 🙂 The moisture from everything cooks the noodles.